Once outdoor temperatures change from warm to cool, you begin to feel cold air not just on your skin but down to your bones! This chill might usher in a new season but it is never fully winter until the first snow fall. You might be excited to see a fresh dusting of snow but the novelty wears off quick! 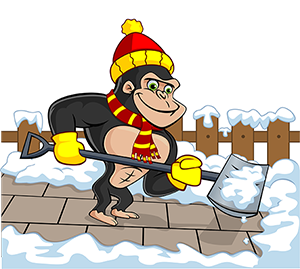 When you are tired of dealing with snow and ice around your property, call a Gorilla for your Sylvan Lake snow removal and salting. When it comes to your Sylvan Lake snow removal and salting, the best treatment method is to keep ahead of incoming weather patterns. This can be a difficult undertaking in an unpredictable climate like Sylvan Lake. Throughout winter months, our Gorillas are constantly monitoring incoming storefronts or weather changes. Instead of only looking out for heavy storms, our Gorillas watch for areas where snow can melt and re-freeze, creating icy areas around homes and businesses. Our services are available by appointment or can be treated with a routine arrangement. As much as you might try to plan ahead, there is only so much that you can do! This margin for miscalculation is why our Gorillas offer 24/7 call-out services as well. Managing a snow fall around your home can be tricky enough but having a multi-unit or commercial property can be even worse. When you partner up with our Gorillas, you are able to have your property cleared away of snow and ice – no matter its size or type. Our Gorillas are able to clear away your residential property quietly during late night or early morning hours. Because snow tends to fall at unusual times over night, our stealthy removal specialists use shovels to clear a path for you! When dealing with multi-unit properties, snowblowers are put to work during daylight hours and ploughs are available for large spaces like parking lots. Over the years, our Gorillas have learned that ice presents some pretty serious health hazards to property owners. That is why we have perfected a salting method that helps you avoid slips, trips and unintended tumbles.